This week, Margaret selected a Vegetable Stir Fry to my delight. We have had too much meat the past month with the Jewish holidays in full force. Another easy dish (you must be sick of being saying this) with flavor. A little soy sauce, sugar and black pepper plus red chilis and basil (which I forgot) gave personality to this dish. Tons of veggies make it a healthy choice. This could be made with different vegetables and I am sure, still be good. Do check out our cooks and see what they thought of this dish. I'm not sick of hearing "another easy dish"!! That is what I love about cooking in general, and Donna Hay in particular. I left out the sugar but included the chilli and basil. It's nice to take a break from the heavy food, eh? I love stir-fry veggie dish! With simple seasoning, but tastes so good! Looks great Chaya. The capsicum (pepper) makes is so colourful. Healthy and easy always catch my eye, great recipe for a rushed weeknite.Thanks for being part of the linkz holiday party. I'm a big fan of Donna Hay. 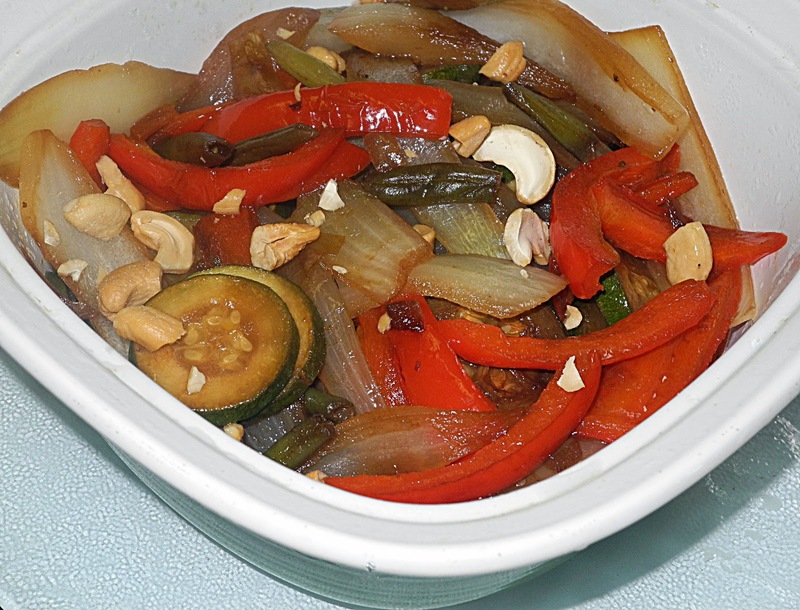 I like the cashews in this stir fry--nice way to add some extra texture.